To give everyone a little update about the gym, I did go to court last week for the revocation hearing and am still waiting to hear the ruling. It ended up being a full on trial with lawyers, cross examination, witnesses etc. I represented myself and a loyal client and friend was in attendance as my witness. Honestly, I feel good about it. The judge even came up to me after, shook my hand, thanked me for my time. Hopefully that's a good sign. If you are new to this story, please click here to learn more. However the decision goes, it is time to announce BtSF will be closing permanently in the home location regardless of the decision that is made and I will be moving from Colorado. Unfortunately the house I built BtSF in was rented. I had anticipated buying it, but with the suspension, I was not able to make this a reality. In April my landlords informed me if I couldn't buy the house, they had to put it on the market by June 3rd and I had to move. This is now my reality and I am now preparing to move back to Minnesota for the summer as I re-asses things. Deposition of Facts Regarding the Suspension of Break the stigma Fitness- This was my defense. Page 1. At this point I could either be completely distraught, or try and turn this into a positive. Don't get me wrong, I was very sad, but have decided to use my energy to problem solve instead of crying about it (anymore) or saying "why me". In this time, my ex-husband has has asked to have our daughter for a month, so that is happening. I have decided to embrace the opportunity the Universe is giving me and hit the open road on or about June 8th for the first ever Fit Cannabis Girl Tour! I will utilize this time to refocus on my health and wellness; mind, body and soul with cannabis, fitness and nutrition. I will document it all and share my secrets back to success with you via Instagram, Facebook, Duby, YouTube and on my new site here. Before I opened BtSF I worked out daily, either outside or at the gym and ran 5K, 5 times a week while documenting my journey on social. This is when I started to connect with others all over the world who also used cannabis in their regimen. I saw the need for education around this way of life and loved to share how cannabis was helping me while also helping others. This is ultimately what drove me to open BtSF. With the time it took to operate BtSF, the stress that ensues with being a first time business owner, and what was going on personally in my life (all telling blog soon to come! ), I have not been able to be consistent in my own health journey. Due to this I don't feel as healthy as I once was and I am excited to refocus on my own health again which will allow me to reconnect to others all over the world in a greater capacity like once before! The Plan- I will leave CO June 4th and go back to MN for a couple days to recharge. Then, I will head out of Minnesota on or around June 8th. First, I am considering going out east to the Michigan High Time Cannabis Cup. Then, I will make my way out west to Arizona, Nevada, California, Oregon and Washington. It will be my mission to educate on cannabis, fitness and nutrition, while I share my back to health journey. I will live life to #breakthestigma of cannabis users while inspiring other to take control over their own health and wellness. This is truly what makes me the happiest, whatever capacity it is in and am excited to take my mission on the open road! During my travels I will indulge myself in one of my favorite passions, photography. 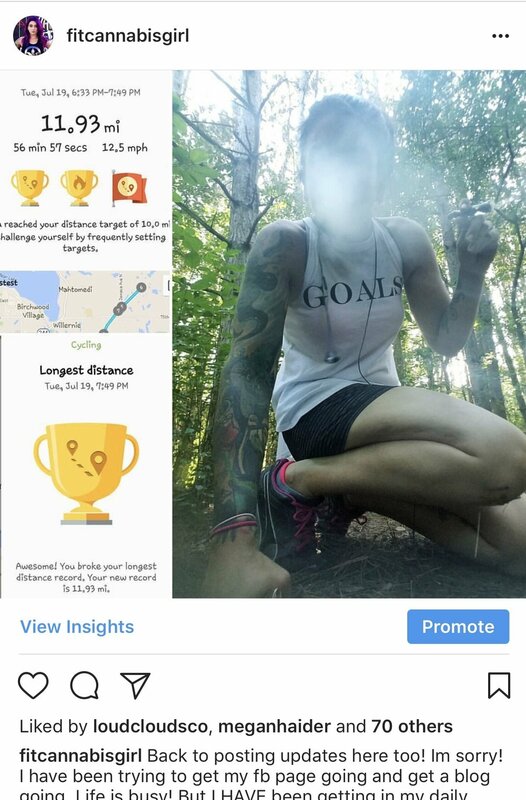 I will also write educational blogs on cannabis, fitness and nutrition and personal daily blogs about my journey including what fitness regimen I am doing, the nutrition I consume and what cannabis products I use to enhance my regimen. I am excited to bring my bike and inflatable kayak so I can really connect back to nature and experience all the amazing things this beautiful country has to offer. Along my journey I will make stops at dispensaries, events and smoke outs where I can connect to others and share my story and mission. To support this dream I am seeking cannabis brands in all legal states to partner with! If you are a cannabis brand or company whose mission aligns with mine, and would like to be an official partner of the tour, please contact me and we can see if it’s a good match! I do have a completed deck and have multiple options available including appearances, social media posts, blogs, speaking engagements, photoshoots, and more! In addition to partners I am also seeking sponsors who will receive logo placement on all tour flyers and on the official tour page. For individuals who would like to support this cause, you can do so here as well! Media Page from my marketing and advertising deck. Check out my media page for more info! Please know how excited I am for this next chapter and how humbled I am to have everyone's support in shares, donations, sponsorships and partners. With this I will be able to continue my mission to #breakthestigma surrounding cannabis while educating and inspiring others! P.S. For those who are curious about my biography blog, Barely Surviving To Healing & Thriving. Part one is being edited and will be out soon!